A place to build character and learn. The Windsor Police Service’s Community Service branch created Camp Brombal to strengthen relations between young people and the police force. The officers also realized that youth from less fortunate situations seemed to be the most troubled. As a result the officers looked for a program that would both educate and offer children an opportunity to learn more about policing, and the officers behind the uniforms. The officers ultimately decided to offer Grade 6 VIP program students the chance to attend a week-long summer camp headed by the force. To host the program, a campsite was established at Point Pelee National Park. To keep the youth busy and entertained, the officers created a schedule packed with educational activities. Officers were recruited to become counselors and cooks. Finally, once the programs were in place and a site identified, funding measures were established. The coordinators decided families should not have to pay for their children to attend. The officers approached community partners and corporations, who were excited and generous toward the idea. Officers decided one of the main fundraising efforts for the camp would be an annual hot dog day, and this tradition continues today with a “Hot Dog Day’ held in front of Police Headquarters, where the chief, deputy chiefs, administrators and officers sell the wares. The first “Hot Dog Day” was a success and in July 2002, the very first camp was born. Initially, the organizers decided to open the first camp to children from the Windsor-Essex County Children’s Aid. Forty-eight youth were selected to attend, and they were split into two groups over a two-week period. While the first camping experience was an overwhelming success, the committee of officers decided to expand their criteria and asked school boards to identify children from the Grade 6 VIP classes who would not otherwise have an opportunity to attend a camp. With the success of the first camp, the officers realized it had to have a name. History would provide that answer and it was decided that the camp would be named after Nereo Brombal. 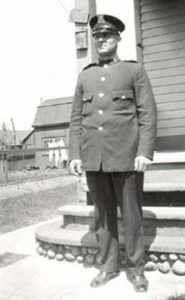 Constable Brombal was a member of the Windsor Police Department in the early 1930s and 40s. In 1940, at the height of the Second World War, a new category had to be added to the annual police budget: “Subversive Activities.” Among those targeted were people of Italian descent, almost 1,500 strong at the time. This segment of the population was sometimes referred to as “enemy aliens” and it affected one of the Windsor Police Department’s own. Constable Brombal had been born in Italy and in June, 1940 the city’s Board of Control recommended that he be indefinitely suspended until the war was over. By this time Nereo had already served as an officer for more than 12 years, yet he was dismissed and would never return to the service again. It would not be until 1990 that the commission finally apologized for firing Nereo. On December 11th, 1990, an official apology was given on behalf of the commission to Nereo’s son, Douglas. Unfortunately, Nereo had passed away in 1974 and never got the chance to make amends in person. Officers with the Community Services Unit approached the Brombal family regarding their camp idea. The Brombals overwhelmingly agreed to the project and further offered their blessings. During the first camp, members of the Community Services Unit ensured they provided campers with healthy food. Not only were the meals nutritious, but care was taken to respect those campers with special religious or dietary concerns. The camp as a whole was meant to be an experience that would be remembered. In some cases, it would change campers’ perceptions of the police community altogether. During camp, counselors kept notes and made observations about the campers. They identified their participation, ability to make friends, willingness to help, and leadership skills. On the last day those who excelled in these categories were given certificates. The counselors noticed marked improvement in the children over the week. This contest also acted as a method of evaluating the camp project. The overall operation of the camp was evaluated and improvements were made from the first to the second year. At the end of year two the same evaluations were made and further changes would be forthcoming. The officers, realizing the momentum gained with the new camp, quickly created a logo. It would be proudly displayed on t-shirts worn by campers and volunteers. These shirts further allowed the service to display the logos of corporate sponsors, giving credit to the corporations responsible for the primary funding of camp. Camp Brombal has an annual cost of $20,000, and children can attend for $400 each. As a result, the Windsor Police Service continuously seeks public and corporate assistance in making the camp free for the children and their families. To honour the unique multicultural diversity within our community and provide boys and girls between the ages of 10-12. These youth might not otherwise have the opportunity to attend camp. The Windsor Police Service is committed to working with our community and corporate partners to support the ‘Camp Brombal’ program.